Today at the Georgetown Debate Seminar, students will be attending a “Kritik Survey” with John Turner, a graduate assistant at the University of Georgia and one of the nation’s foremost experts in the application of critical theory to debate. In order to prepare the rising sophomores for this survey, we will first be providing an introduction to critique arguments—something that some post-novice students dread, others crave, and all most definitely need. Many other students throughout the country are probably in a similar position, so below the fold are some resources that will help young debaters gain a basic grasp of “The K”. This entry was posted in Evidence/Research, Kritiks, Research/Links on June 27, 2010 by Bill Batterman. In a critique of the West’s postcolonial self-flagellating tendencies that is both fascinating and repellent, prize-winning French novelist and essayist Bruckner (Tears of the White Man) offers a broad defense of neoliberal democracy as a force for progress, enlightenment, and emancipation. In polemical tones, the author identifies how the aftermath of WWII and postcolonial liberation movements spawned a pathology of remorse and guilt corrupting the European self-image that was maintained by its own intelligentsia and by a variety of immigrants, Islamists, and Arabs. Though the book offers insightful analyses of how discourses of guilt and self-hatred can serve to mask self-glorification and assertions of cultural superiority, it is marred by a monolithic, often Franco-centric view of Europe, a tendency toward overgeneralization, and an almost total disregard for how global economic concerns and practices are linked to international dissatisfactions with the behavior of Western democracies. Nonetheless, as a work that takes seriously the challenges posed by multiculturalism and the changing face of Europe, it is a worthy attempt to resuscitate the ideals of progressive enlightenment, political action, and civic pride. This entry was posted in Kritiks, Research/Links on June 26, 2010 by Scott Phillips. This is a starter security K file I did for camp this summer. Edit- if you have questions/comments please post them here instead of emailing me. This entry was posted in Evidence/Research, Kritiks, Research/Links on June 26, 2010 by Scott Phillips. This entry was posted in Research/Links, Technology on June 26, 2010 by Scott Phillips. In the post-cold war world those engaged in making foreign policy seem adrift searching for new ideas. Despite the growing production–and in some cases the sophistication–of scholarly literature on questions in international relations, policymakers seem to ignore much of this scholarly work in their search for new policy ideas. The contributors to this volume examine the promise and possibilities of making contemporary international relations theory more relevant to the conduct of foreign policy and international affairs. The essays in this volume assess the gap between theory and practice. The volume has two parts. The first part explores the failure of much international relations scholarship to address practical problems. These essays consider problems arising from differences in the questions that concern academics and policymakers, the institutional settings in which they operate, and the perceptual and motivational baggage they carry. 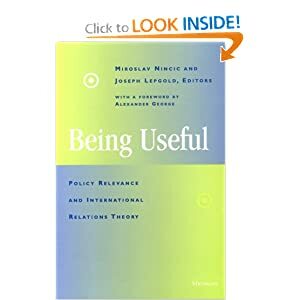 Essays in the second part of the book illustrate how international theory and research could be made useful to policy makers. First, these writers argue that scholars should pay more attention in theory to the way foreign policy is shaped by its domestic political context. Second, scholars should do more to demonstrate how certain areas of specialized research shed light on specific policy challenges and how approaches based on the rational-actor model can help make sense out of current policy dilemmas. There are many sources of fear in world politics — terrorist attacks, natural disasters, climate change, financial panic, nuclear proliferation, ethnic conflict, and so forth. Surveying the cultural zeitgeist, however, it is striking how an unnatural problem has become one of the fastest-growing concerns in international relations. I speak, of course, of zombies. For our purposes, a zombie is defined as a reanimated being occupying a human corpse, with a strong desire to eat human flesh — the kind of ghoul that first appeared in George Romero’s 1968 classic, Night of the Living Dead, and which has been rapidly proliferating in popular culture in recent years (far upstaging its more passive cousins, the reanimated corpses of traditional West African and Haitian voodoo rituals). Because they can spread across borders and threaten states and civilizations, these zombies should command the attention of scholars and policymakers. This entry was posted in Research/Links on June 24, 2010 by Scott Phillips. This is the sort of moment that people write books about, a moment when the size of the personalities matches the scale of the stakes they’re wrangling over. The real question is whether this Democratic President and the military, symbolized by Petraeus, can make the adjustments necessary to live with each other. It seems obvious that Obama is going to have to be less coy with the public about what is really going to happen in July 2011, even if that risks alienating his party’s vestigial antiwar base. He is going to have to make it clear that “significant” troop withdrawals — a word bandied about in recent weeks — are not in the cards unless the situation on the ground changes dramatically, for good or ill. And Petraeus is going to have to reconsider whether the crown jewel in his tiara — the counterinsurgency doctrine — is really feasible in Afghanistan and what strategic modifications will have to be made in order to leave the place in the most stable, humane fashion. This could include a lot of country specific arguments (from China threat to certain brands of orientalism) or your garden variety security K. The concept of where identity comes from is often not really debated, or debated crudely in the form of “you make china a threat”. This card imo is one of the best I have seen for the aff vs such args. This entry was posted in Evidence/Research, Kritiks, Research/Links on June 24, 2010 by Scott Phillips.